How high are realtors´ and lawyers´ fees in Croatia? What about other property purchase costs? How difficult is the property purchase process in Croatia? Real estate can only be acquired by nationals who have a reciprocity agreement with Croatia; that is when Croatian nationals can themselves freely buy property in the buyer´s home country, such as the EU countries (except Italy), the United States, Russia and Hungary. Nationals from Italy, Switzerland, and Bosnia and Herzegovina can only buy property if they plan to settle in Croatia permanently. In most cases, reciprocity is assumed until proven otherwise. Consent (in the form of an administrative act) must be secured from the Ministry of Foreign Affairs before the sale could be finalized. Securing the consent takes two to six months since the Ministry has to study the foreign laws (that of the applicant) to discern if a reciprocity agreement is in place. The Ministry of Foreign Affairs may seek the opinion of the Ministry of Justice, Administration, and Local Self-Government (Ministarstvo Pravosuda, Uprave i Lokalne Samouprave) before granting the consent. Foreigners, pursuant to the Law on Property Ownership and Other Real Rights, cannot acquire agricultural and forest land. Foreigners may not acquire properties considered protected cultural monuments, unless the local authorities waive their pre-emptive right to acquire the property. Note that foreigners can only rent out through a company, which involves paying 25% VAT, which can be accounted as a business cost. However, VAT is waived on renting of housing premises. The following is the acquisition process. Pre-contract agreement between the buyer and vendor (seller). The buyer is expected pay a down payment equivalent to 10% of the selling price (This percentage may differ, depending on the contracting parties, and the down payment can be as high as 15%). Power of attorney, if an attorney is involved. A binding contract is then prepared by a lawyer and signed by the notary. An official note of the contract should be made in the Land Registry. Once MOFA consent is granted, the contract needs to be registered in the Municipal Cadastral Department´s Land Books (Zemljišne Knjige), and the purchase tax needs to be paid. The 5% real estate transfer tax does not apply to new buildings. In this case, a 25% VAT is levied on the construction value of the building. New buildings are defined as properties built after 31 December 1997. At pre-contract stage, the down payment is not returned if the buyer fails to fulfill the terms of the contract. In cases where the seller fails to fulfill his part of the contract, he is expected to compensate the buyer by paying double the sum of the deposit. There is an issue concerning clean titles. A third of the population fled the country during the war. A big possibility exists that the ´owner´ may not be the legal owner (especially if the rightful owner happens to be a Serb). The government does not allow purchase of properties with unclear ownership. It is advisable to establish the rightful ownership of the property, before getting to the pre-agreement stage. Hence, title registration is a slow business in Croatia. It takes an average of 113 days to complete the five procedures necessary for property registration. VAT is imposed on new dwellings, and is paid by the seller, who usually passes it on the buyer through an increased purchase price. Real estate transfer tax of 5% of the market value is imposed on the transfer of real estate ownership. This tax is payable by both domestic and foreign legal entities and individuals, unless an international treaty provides otherwise. Buyers may not be obliged to pay this tax if certain conditions prescribed by the Real Estate Tax Act are met. The transfer tax does not apply to the acquisition of new buildings, that is, first sale. Instead, the sale is subject to 25% VAT of the value of construction, i.e., the net construction value. The Value Added Tax (VAT) is levied at a flat rate of 25% as of 01 March 2012. It is common practice to hire a lawyer to do all the necessary preparations. Lawyers typically charge around 1% to 1.25% of the purchase price (plus 25% VAT). The commission for real estate agents ranges from 3% to 6% (plus 25% VAT) paid separately by the buyer and seller. Foreigners are typically charged more. Agents in Croatia are not licensed, so buyers must be careful when dealing with them. Registration fees and other fees are around 0.01% to 0.05% of the property value. 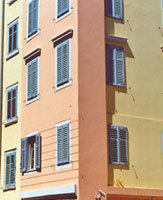 How landlord-friendly is the law in Croatia?